BDO Foundation, the corporate social responsibility arm of BDO Unibank, was recognized again for promoting the welfare of underserved members of society and empowering disadvantaged communities. Officials of BDO Foundation, the corporate social responsibility arm of BDO Unibank, and its partner, the Foundation for These-Abled Persons Inc. (FTI), mark the turnover of 100 typhoon-resilient resettlement homes in Sta. Fe, Leyte before Christmas 2018. The foundation also built a multipurpose hall in the village (inset) to support the livelihood activities of the beneficiaries. Its program for persons with disabilities (PWDs) affected by Typhoon “Yolanda” was recently recognized by The Asset Corporate Awards as a Highly Commended Initiative in Social Responsibility. The award, presented to BDO Unibank at an event in Hong Kong, cited the foundation for developing a community for calamity-stricken PWDs and supporting their livelihood. 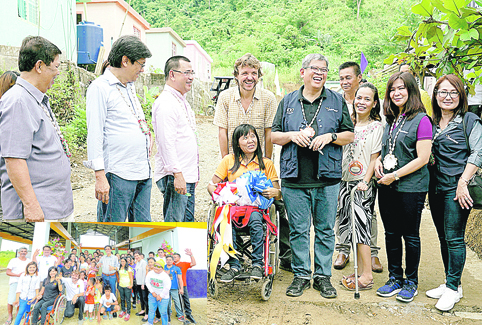 BDO Foundation and its partner, the Foundation for These-Abled Persons Inc. (FTI), a non-profit organization that promotes the welfare of PWDs, built a community for Leyte-based PWDs, who were displaced and left homeless by Yolanda. In line with its disaster response advocacy, BDO Foundation and FTI constructed 100 typhoon-resilient resettlement homes in Sta. Fe, Leyte for the disabled people and their families. The PWD community, touted as the first of its kind in the Philippines, was backed by the provincial government of Leyte, the Sta. Fe Municipal Social Welfare Development Office and Institute for Social Entrepreneurship. BDO Foundation also built a multipurpose hall in the village to support the livelihood activities of the beneficiaries. The PWDs use the structure to manufacture school furniture, which the foundation purchases for its school buildings program. The award-winning corporate citizenship initiative aims to alleviate the plight of persons with disabilities, who have lost their homes and livelihood in the wake of the super typhoon. The PWDs of Leyte bore the brunt of the disaster, as many of them did not have immediate access to aid due to their disability. Organized by Asset Benchmark Research, The Asset Corporate Awards recognizes outstanding achievements in corporate sustainability, social responsibility and investor relations. The Asset award is the latest international recognition given to BDO Foundation for its program for PWDs. The foundation also received the prestigious Corporate Social Responsibility Program of the Year Gold Award from Asian Banking & Finance, and an award conferred by Enterprise Asia at the Asia Responsible Enterprise Awards for the same program.